We often talk about the “Be Well Family” and try to stay close to our participants, some of whom have been part of what we do since the very first sessions. Their stories are part of our story and here are some of them. Having worked all her adult life Ann (65) had looked forward to enjoying a leisurely retirement. Like many others, however, she soon found that the initial sense of being on holiday was replaced by a feeling of aimlessness, the days began to drag and her mood was negatively affected. 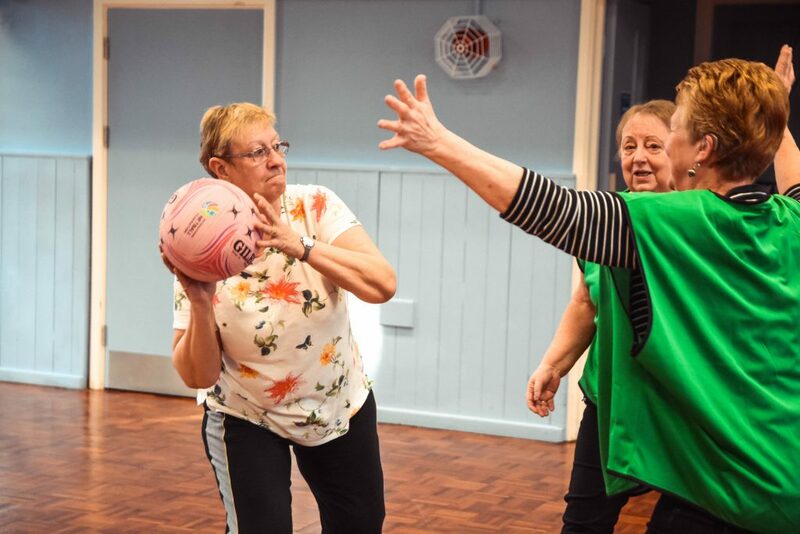 The first thing Ann discovered was that Walking Netball involves a lot of laughing, quite a lot of chatting and very little in the way of cut-throat competitiveness. In fact, nobody keeps score and nobody can be what she calls “a star turn” as an early rule modification was that when your team gets the ball everybody has to receive and give a pass before someone shoots. Ann enjoys Netball so much she even went for a brew every week when a gardening-related injury meant she couldn’t play. 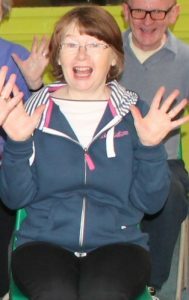 Ann told Be Well that she ‘looks forward to Mondays all weekend’ because of her morning Netball session. As demand grew the new session in Whitfield had a Beginners section added and a second session was put on in Hadfield. Ann does them all, is active in organising group “socials every couple of months” and even volunteers at the Community Café social eating events organised by Be Well’s spin-off organisation Eat Well Glossop. “Retirement has really started making sense for me” she says, with a smile which tells its own story. 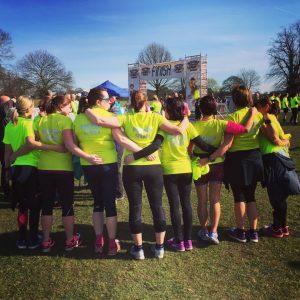 With our Mums Run groups going from strength to strength we hear a lot of positive things but few quite so powerful as Caroline’s Story which, because it is very personal has been anonymised. The image we have used is one from a recent 10k race which some of the Mums Runners took part in, but not necessarily Caroline. running in the past but I had never been able to run for very long and had given up quite easily! I had always fancied running but I just couldn’t find the motivation to do it. In 2014, totally out of the blue, my eldest son was diagnosed with Juvenile Idiopathic Arthritis. We have never had any serious medical problems as a family and suddenly I was faced with a hideous autoimmune disease in a 7-year-old! Henry’s knee kept on swelling up and we would end up at the hospital having to have it drained in theatre and steroids injected. After a year of going in and out of hospital he was put on a chemotherapy drug which lowered his immune system so that his own immune system would stop attacking his body. I felt as though I was poisoning my baby with a hideous drug which had many side effects and, with my anxieties growing and my son’s fears and sickness not subsiding, I soon felt as though I couldn’t cope and suffered with horrible anxiety towards the end of 2015. On top of all these fears about my eldest son’s health, my youngest son’s teachers were indicating that he was experiencing social and emotional problems and mentioned autism! I was totally unaware that there was anything wrong with William but, as it became clear that he was struggling with his behaviour in school and was suffering with his emotions, we worked with the school and are now getting him assessed for ASD. This totally broke my heart and still does. He is such a gorgeous little boy, bright as a button and it’s heartbreaking to watch him trying to make sense of the world that is, at times, totally alien to him. Over the last few years I have gone through a whole load of emotions and faced fears that many parents don’t have to face. If I’m honest, I have mourned the children that I thought I had. My hopes and dreams for them disappeared overnight and that realisation has taken a toll on my own health. Which is where Mums Run comes in. Running has been my outlet for the past 6 months. I run about three times a week with Helen the Run Leader and I LOVE it. The group of girls I run with are so lovely and are from all walks of life that I wouldn’t have met up with normally. They welcomed me into the group with open arms and have encouraged me every step of the way. The girls made me realise that I CAN do this! When the girls said ‘you’re doing great’ I believed them and most importantly, I started to believe in myself again. Running has not only helped with my fitness levels (I’m the fittest I’ve ever been!) it has also helped me tremendously with my mental health. Going for a run with the group after I drop the boys at school totally clears my mind and puts me back on track with my emotions. It’s a bit of me-time and a huge stress release for me. I feel totally free, like a bird. It gives me much needed head space and I forget about my stressful home life. I see countryside I don’t normally appreciate and I hear the birds, which totally grounds me. Running with other women has helped me to become a stronger person, both physically and mentally. I can continue to be a fantastic mummy to my boys, have the strength to fight their battles and to encourage them to just be themselves as they are perfect the way they are; something I totally lost for a while in the midst of my anxieties. If I have had a bad day at the hospital with my son I can go out for a run and it totally eradicates all my pent up anxiety. I chat to the girls and we have a laugh (sometimes way too much!) and it totally erases the stresses of the day; so much cheaper than therapy! The girls reassure me that everything will be ok, and it usually is. I can’t thank Helen and the girls enough, I am so glad I made the decision to run alongside them last September. They literally came to my rescue at a time in my life that I needed support. This running group has changed my life. Helen has been so kind, caring and encouraging every step of the way. I can’t believe I actually ENJOY running now. I am so proud of myself and the obstacles I have overcome. I am now helping and encouraging my boys on every level and am so much stronger physically and mentally and able to cope with whatever life throws at me. At 40 years old, I feel a real sense of achievement. Running has taught me that with grit and determination, I can achieve anything; and cope with anything. I am even encouraging new runners now! I am forever grateful to this group and so glad I found them, I have made some lovely new friends and I will never look back. In February 2016 Kay was not a happy person. We know this because she told us. “The thing I like about Be Well is that it makes me happy” she says “And before I started doing the walk and the ‘sittercise’ I always felt something was missing.” What she calls ‘sittercise’ we call Jazz Hands and Fancy Feet, of course, but it’s not what you call it that counts it’s what it does for you. 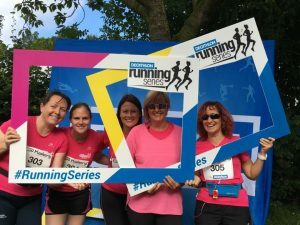 We are nothing if not flexible and when Derbyshire County Councillor Ellie Wilcox asked us to help get women running in partnership with Glossop Parkrun we took on the challenge. From one “school gate walk/jog/run” we grew the #ThisGirlCanMove programme to include three schoolgate runs and a weekly social run on Monday evenings. One woman who has joined us and felt the benefit is Louisa who tells her story in her own words…. “In 2015 I had an idea to have a go at running to try and improve my fitness and lose weight. Since having children my usual exercise habits had taken a back seat so I was looking for something that I could do that didn’t need much preparation, equipment or money. I had always told myself after a bad experience at school that running was not for me but it seemed to fit the narrow requirements I had. I never plucked up the courage to give it a go though. Then in early 2016 I saw a post about a running group starting from my kids’ school gate but unfortunately for me it was on a day that I worked – I was gutted. So I thought I should get on and try and run on my own. I downloaded the NHS “Couch to 5k” app and started on the treadmill at work. I completely underestimated how hard it would be! Then an opportunity arose where I could join the Be Well walk/jog/run group starting at Gamesley Early Excellence Centre where they generously offered an hour of daycare for my son whilst I went for a run. This was a breakthrough for me. Running with a group of ladies was far more enjoyable than the solo slog on the treadmill; we shared stories, we encouraged each other and we all reaped the benefits of steady progress. From there I joined some of the ladies on some evening runs and now I am running 3 or 4 times per week. Running as a group is great, I’ve made good new friends; we laugh, chat and egg each other on. My next milestone was taking part in the local park run. Here is where I realised how much progress I had made. My first attempt at the 5K run took 36mins; my last 5k attempt was 28min! I feel amazing, I have lost a stone in weight, I sleep better, I have so much more energy, my skin has improved and I feel happy. When the town planners of Manchester City Council who made the decision to “relocate” thousands of their inner city residents to the hilltops of Hattersley and Gamesley they can have had little idea that they were creating islands of isolation on the outskirts of existing towns which nearly 50 years later still struggle to integrate with their new communities. In Gamesley the impression that the new arrivals were being kept separate is magnified by the street layout which seems like an impenetrable rabbit warren of paths and entries, completely encircled by a single ring road, around which cars, vans and busses roar like the Indians in the “Cowboy” films from around the same time as the estate went up. One up-side of the estate’s isolation is the strong community spirit which pervades the place with three and four generations of the same family living within streets of each other while the phrase “everyone knows everyone else’s business” is spoken with pride. But even in the strongest communities there is always the possibility that people, even strongly connected people, can slip through the cracks. So it was for Pauline, a mother and grandmother, who has lived on Gamesley since the early days and knows more than most about who is doing what and why. In her seventies now, she had got stuck in her house when first she was ill and then her husband was ill. By the time they both got back on their feet Pauline had got out of the habit of leaving the house and was fearful about going past her own front door. She may have been physically on the mend but her mental health was suffering and she was at risk of depression and a downward spiral into further ill health. One of the few places she would go was her daughter Ginty’s, just a few streets away but, significantly, actually on the estate ring road with a lovely view over the Roman fort to the Cheshire hills. While on a visit one Thursday Pauline glanced out of the window and saw two of her friends walking with a group of other older people and a chap she didn’t recognise in a yellow vis-vest. Being a curious sort she popped her head out the window and asked them what they were up to and, while the walk leader pressed “pause” she got the full story of WellFit and its walks and seated exercise sessions. 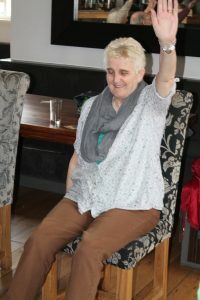 Its a testament to Pauline’s determination, but also a vindication of the decision to organise such low level but highly sociable sessions regularly and locally, that within the month Pauline had joined the walk and was proudly greeting other residents and advising them to get themselves involved. A year later Pauline has added the EasyFit session to her weekly calendar, has rejoined “the club” every Thursday afternoon and recently went to a family meal in town on a Wednesday evening. Pauline’s story is not uncommon. The change of scene, the contact with other people, the sense of having something to do, albeit for only an hour or so, all have a huge impact on the life of an inactive person. 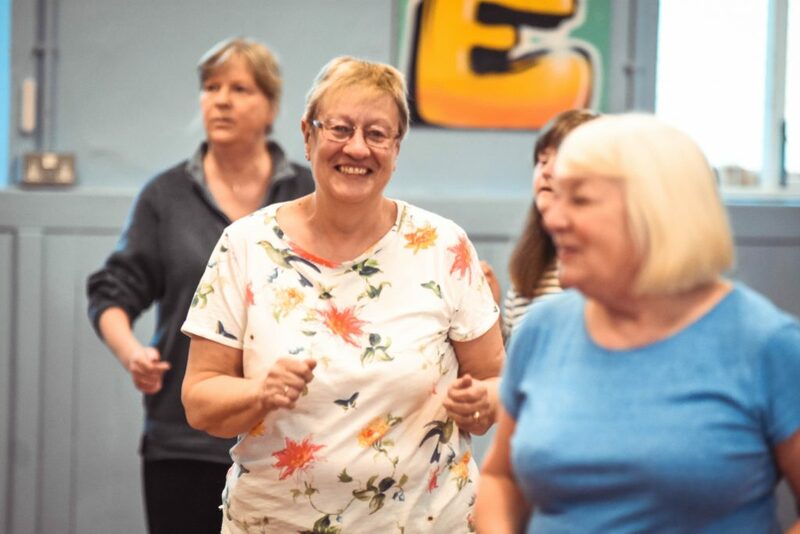 Inactivity is a mental illness not just a physical condition and the impetus that locally delivered physical activity sessions can have is out of proportion to the effort and cost of making them happen. Ask Pauline. “Walking Football saved my life” sounds like the sort of headline you’d read in a tabloid or gossip magazine, but one of our regulars, Keith Clegg, has actually said those words to us. Keith – universally known as “Cleggy” – is the 73-year-old poster boy for our Glossop walking football session. He’s featured on flyers, in newspaper articles and on the beer mats in our favourite beer and wine bar. He’s played at the FA’s palace of development at St George’s Park and against the official Parliament Walking Football Team. He played when we had four people at each session and he played in the glory days before every town had its own Walking Football session and we had 24 players turning in. He loves walking football. But when he first came to our sessions he was not a well man. As an older man Cleggy, a former semi-professional footballer, had taken up golf and loved it, but following an “episode” he found himself without a heart, reliant on technology and unable to manage one hole of stick and ball, let alone 18. And it got him down, it got him down badly. Where do you go when you can’t play golf any more? For far too many people the answer is “nowhere”, but for Cleggy, thank goodness, it was “walking football” – a pastime he took to like a duck to water. His commitment to playing beautiful football had somehow survived the years and he immediately started demanding the ball to feet, bossing the midfield and stopping every ten minutes or so to let his pacemaker catch up. He laughed, we laughed and he started to get better. At Christmas 2013 he was visiting the heart clinic every week and struggling to get through his regular MOTs. Twelve months later he only had to visit the clinic once a year and sailed through his regular checks. Walking Football is a wonder drug which works on the body but more particularly the mind. We are social animals, and the motivation to keep coming to football – contact with other men with a shared interest and membership of a friendship group – is so strong that its easy to keep taking the medicine.